Background: Pressure ulcers (PUs) continue to be a major health care problem. Purpose: The aim of the present study was to determine the incidence and risk factors of PUs in ventilated patients in two medical /surgical ICUs in Athens, Greece. Materials and Methods: A prospective study in two medical/surgical ICUs was conducted. Two hundred sixteen patients with more than 48 hours on mechanical ventilation (MV) were enrolled during the studied period. The PUs of patients were measured according to the European Pressure Ulcer Advisory Panel (EPUAP). Results: incidence and incidence density of PUs was 29,6%, 14 cases per 1000 mechanical ventilation days and 13,9 cases per 1000 patient- days of ICU stay respectively. Logistic regression identified that the Cubbin and Jackson scale score ≤29(OR 0.015, CI 95%, 0.005-0.050, P 20 days (OR 7.225, CI 95%, 2.461-21.207, P 20 days. Cubbin and Jackson scale is a useful risk assessment scale for the early identifying of ventilated patients at risk for PU and the implementation of an intervention PU bundle. These interventions will contribute to reducing the incidence of PU and improvement of the quality of care for medical/surgical ICUs ventilated patients. A pressure ulcer is an area of localized damage to skin and underlying tissue caused by pressure, shear, friction and or combination of both thes . The development of pressure ulcers (PUs) remain a problem and is a major issue in nursing care. The quality of nursing care is regarded as the key factor in the prevention of PUs . Intensive care patients are a particularly high risk group of developing PUs. These critically ill patients are generally not able to notice increased tissue pressure and to react accordingly, because they receive sedation, analgesics, and/or muscle relaxants. Moreover their underlying disease, hemodynamic instability and oxygenation disorders increase the risk of developing a PU [3-5]. Compared to the total hospital population, PU prevalence and incidence rates in ICU patients are the highest. It is estimated that a percentage up to 13% of patients develop pressure sores while being treated in an intensive care . Weststrate et al conducted a study in four European countries and found that the PU prevalence in intensive care was 14% in Italy,4% Denmark, 38% in the Netherlands and 49% in Germany . A different study in the United Sates revealed that the prevalence in medical intensive care was 20% . In addition, a prevalence study in the Netherlands found that the PU prevalence in all intensive care specialities was 28,7% . The development of PU is a very complex and usually multidimensional phenomenon, with pressure, shear, friction, moisture and poor nutrition, contributing directly to the development of PUs [9,10]. Pressure however is the most important factor in the development of PUs. There is a positive correlation between PU and duration of pressure, intensity, tissue tolerance  and length of stay . Studies have shown that older individuals and women develop more often PUs [12,13]. Ventilated patients are especially susceptible to the development of PUs14 but truly independent predictive factors have yet to be conclusively established.15 Previous authors14,16 reported that oxygenation and perfusion variable were significantly associated with PU development. This may be explained by the local effect of hypoperfusion or hypoxia or by the lower frequency of turning in these unstable patients. However, other authors found no significant relationship between these variable and PU onset17 and de Laat et al.,18reported that circulatory shock did not seem to affect PU development. The treatment and prevention of PUs consume large quantities of resources in terms of disposable equipment and nursing time . Moreover, PUs have been described as one of the most costly and physically debilitating complications in the 20th century . The PUs are the third most expensive disorder after cancer and cardiovascular diseases . The prevalence and the incidence rates of pressure ulcers and the cost of treatment constitute a substantial burden for our health care system and cause concern for health care providers. The treatment costs for each ulcer can range from £500 to £40000 [22,23]. The United States spends an estimated £11billion per year for treatment of pressure ulcers . Pressure ulcers also increase patient length of stay, discomfort and nursing care hours. In addition to all of these negative effects of PUs, the presence of PU has been associated with a two-to fourfold increased risk of death in critically ill patients, especially older patients in the ICU . The first step of PU prevention is to correctly identify the patients at risk. With regard to ventilated patients, to our knowledge, no previous data for incidence and risk factors on PU have been reported in Greece Few studies have been published on the incidence and the specific risk factors of PU in ventilated patients, a high-risk group [18,26,27]. Information on PU incidence and risk factors in patients on MV may be especially useful for the early and appropriate implementation of preventive measures, with the consequent costs saving. The aim of this study was to determine the incidence and incidence density rates and identify the risk factors associated with PUs in ventilated patients in two medical/surgical ICUs in Athens, Greece. This prospective observational study was carried out in two ICUs, in Athens, Greece, from January 2009 to December 2009. The Cubbin and Jackson scale was used to assess the risk of developing PUs. The Cubbin and Jackson scale developed and revised an ICU PU risk assessment tool based on the Norton scale, which assesses physical condition, mental condition, activity, mobility and incontinence. The Cubbin and Jackson scale also incorporates age, weight, past medical history general skin condition, mental condition, mobility, hemodynamic status, respiratory status, nutrition, incontinence and hygiene. The total Cubbin and Jackson scale score ranges from 12 to 48 points. The risk of PUs increases in patients with score ≤ 29 points. ( cut-off point). The grading system of the EPUAP  was used and recorded according to the Defloor and Schoonhoven statement . The PU grading, according to the EPUAP classification system, is a numerical four-grade system, in which each grade is defined by the anatomic limit of soft tissue. The PU grade 1 ,because the tissue damage is still reversible, is not considered a wound [28,29]. Therefore PU grade 2-4 are considered to be clinically relevant. • Grade I: Non blanchable erythema of intact skin, discoloration of the skin, warmth, edema, induration, or hardness may also be used as indicators, particularly in individuals with darker skin. • Grade II: Partial thickness skin loss involving epidermis, dermis, or both. The ulcer is superficial and presents clinically as an abrasion or blister. • Grade III: Full thickness skin loss involving damage to or necrosis of subcutaneous tissue that may extend down to, but not through, underlying fascia. • Grade IV: Extensive destruction, tissue necrosis or damage to muscle, bone or supporting structures with or without full-thickness skin loss. The study protocol was approved by the institutional review board at each hospital and patient confidentiality was protected. During the surveillance period, all patients admitted to ICU and ventilated for at least 48 hours were actively monitored for pressure ulcers until their discharge or death. The surveillance of pressure ulcers was performed by a specially trained ICU nurse (ICU link nurse). It included daily clinical examination of patients and daily reviewing of the patient’s medical records and nursing charts data. Data collected for each patient were recorded on a standardized survey record form. 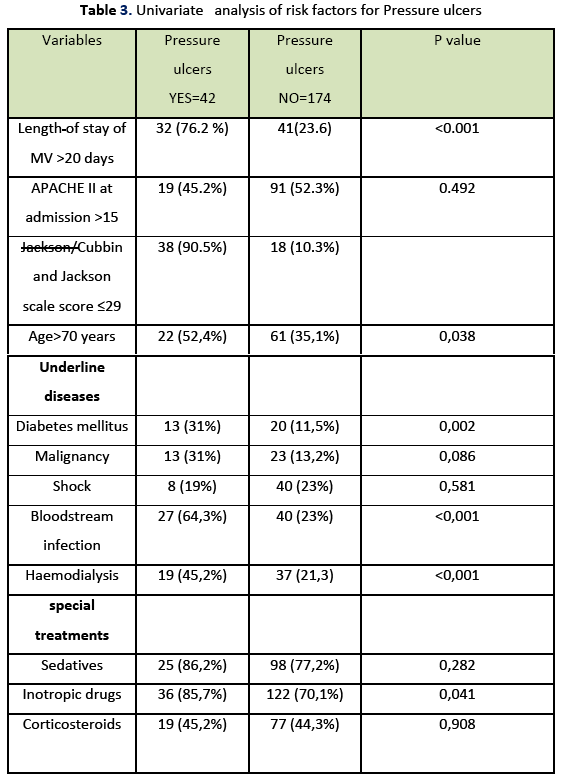 Patient data included demographic characteristics, disease severity determined by the Acute Physiology and Chronic Health Evaluation (APACHE) II score on admission, co-morbidity determined by the weighted Charlson co-morbidity index on admission, date of onset, the location and stage of the ulcer and outcome on discharge from the ICU, the administration of certain medications, sedatives, vasopressors, inotropics corticosteroids, level of haemoglobin and serum albumin. Within 12 hrs of admission, an initial assessment form was completed and the Jackson/Cubbin scale score was calculated. The cumulative incidence was the percentage of ventilated patients who developed PUs in the ICU. Incidence density was computed per 1000 patient days on MV and per 1000 patient days. Continuous variables are expressed as mean ± standard deviation (SD) and categorical variables are expressed as a percentage of the total number of patients analyzed. Continuous variables were compared using the Man-Whitney U-test or Student’s t-test, since the comparison was made between two groups, and categorical variables were compared using the Chi-square test or Fisher’s exact test. The dependent variable was pressure ulcer. Univariate analysis was used to compare variables for the outcome groups of interest (patients with pressure ulcer vs patients without pressure ulcer). To identify risk factors independently associated with pressure ulcer, variables found to be significantly different between patients with pressure ulcer and patients without pressure ulcer in the univariate analysis, were entered into a stepwise logistic regression model. Estimates of relative risk from the exposures of interest expressed as odds ratios (ΟR) for the stepwise logistic regression analysis, were calculated along with 95% confidence intervals (CIs) derived from maximum likelihood estimation. All p-values less than 0.05 were considered significant. Analysis was performed using the SPSS software, version 20. During the study period, surveillance data were prospectively collected for 216 ventilated patients who were hospitalized in two medical-surgical ICUs for totally 4604 ICU-days and 4554 MV days. Patients baseline characteristics are summarized in Table 1. A total of 64 PUs (≥ grade II) developed in 42 of the 216 patients, a cumulative incidence of 29,6%. Incidence density was 14 cases per 1000 MV days and 13,9 cases per 1000 patient-days of ICU stay. Twenty eight of 42 patients (66,7%) developed one PU, eight patients (19%) developed two PUs, four patients (9.5%) developed three PUs and two patients (4.8%) developed four PUs. The highest observed PU grade was IV. The most common body sites of PUs were the sacrum, heel, and hip (Table 2). Multivariate analysis (Table 4) demonstrated that the risk of PU is 98,5% greater in patients with Cubbin and Jackson scale score ≤29 (OR=0.015, 95% CI, 0.005-0.050, P<0.001) and 622.5% greater in patients with length of stay of MV >20 days (OR=7,225, 95% CI, 2.461-21.207, P<0.001) than in patients without Cubbin and Jackson scale score ≤29 and length of stay of MV >20 days, correspondingly. Hospital-acquired PUs are one of <never events> which are being targeted by the Centers for Medicare and Medicaid because they greatly complicate hospitalization, resulting in higher costs for the patient’s care. Most <never events> are considered preventable if evidence-based measures are consistently applied. This study revealed that PUs constitute a significant problem in ventilated patients in the selected ICUs, with an cumulative incidence rate 29,6 % or incidence density rate 14 cases per 1000 MV days and 13,9 cases per 1000 ICU-days Reported incidences of PUs in ventilated patients vary widely 15%-32% [18,26,27]. This difference most likely reflects variation in the characteristics of the cases, PU classifications, inclusion criteria, and data collection methods. Manzano et al.,  in a prospective cohort study in ventilated patients in 9 medical/surgical ICUs in Granada reported an incidence of grade II-IV markedly lower (16% vs 29,6%) and incidence density similar (13,5 versus 13,9 cases per 1000 ICU-days) in comparison to our study. De Laat et al.,  described a similar incidence (28%) and higher density (32 versus 13.9 cases per 1000 patient-days of ICU stay). By contrast, Pender and Frazier [22,26] reported a lower cumulative incidence (20%) in an intensive care unit in a Midwestern hospital in the United States. As PUs may be considered a nosocomial complication or one of the <never events> which is considered preventable the implementation of a multidisciplinary approach and an intervention PU bundle are essential the importance of which has been demonstrated in many studies [25,26,30,31]. In our study, Cubbin and Jackson scale score ≤ 29 independently predicted the development of a PU. This finding confirms that the implementation of the Cubbin and Jackson scale as a risk assessment scale in ventilated patients can provide the clinician with information that can be translated into an effective plan for PU prevention. Specifically, υsing this scale suggests to the nurses whose patients are at the high risk of PU development in order to improve quality of care in medical/surgical ICUs. A high incidence of PUs have been considered to be a negative care outcome32 that markedly affect patients’ quality of life, morbidity and mortality.33 Preventive care must focus on decreasing the incidence of new ulcers, however, such care can be an expensive use of hospital resources. Thus, it is important to have the best possible definition of an <at risk> population so that these resources can be focused. In addition, we found that a modified factor associated with PU was the length of stay of MV >20 days in ICU patients. This finding is consistent with previous investigators’ results  and . suggests that ventilated patients are vulnerable to developing PUs. The daily sedation vacation and daily assessment of readiness to extubate are critical to prevent PU and other health care associated infections . In the study by Manzano et al.,  multivariate analysis revealed time on MV, winter season, age, first day respiratory SOFA score, and forth-day cardiovascular SOFA score as independent predictive factors for the development of a PU. We found no association between PU development and age>70 years, diabetes mellitus, bloodstream infection, haemodialysis and inotropic drugs, whereas, previous studies reported that these variables are independent risk factors, [3-5] likely because of the sample size of study population was not large enough . Our results should be interpreted in the context of several potential limitations. Firstly, we did not examine the impact of turning of ICU patients and periods of higher nursing workload on the PU incidence. Secondly, our study did not include a sufficiently large number of patients in order to identify the risk factors for PUs. Finally, our study was conducted at two medical-surgical ICUs ventilated patients in Athens. These patients may not exhibit the typical characteristics of patients at other ICUs in Greece. This could result in overestimation of the condition in this population of ICU patients. Our findings highlight the need for a multi-central study involving a greater number of patients, so that future investigators could confirm that a lower Cubbin and Jackson scale score and the length of MV days are independent risk factors for PUs. In conclusion, the findings of this study suggest high incidence and incidence density of PU. The most important risk factors that are independently associated with increased risk of PU were found to be Cubbin and Jackson scale score ≤ 29 and length of stay of MV>20 days. Special attention is given to the eradication of all preventable PUs from ICUs ventilated patients and the improving of quality of care through education and awareness. Furthermore, an increase in accountability for the early implementation of evidence-based pressure ulcer prevention bundle and pressure ulcer prevention program is essential. European Pressure Ulcer Advisory Panel (EPUAP). Guidelines on treatment of pressure ulcers, EPUAP review1999;1:31-33. Pancorbo-Hidalgo LP, Garcia-Femandez FP, Lopez-Medina IM, Alvarez-Nieto C. Risk assessment scales for pressure ulcer prevention: a systemic review. Journal of Advanced Nursing 2006; 54(1):94-110. De Laat E. Pressure sores in ICU patients. A literature review. Verpleegkunde 1997;12(1):4-14. Kaller BP, WILLE j, Van Ramshorst B. Pressure ulcers in intensive care patients. A review of risks and prevention. Intensive Care Med 2002;28 (10):1379-1388. Bours GJ, De Laat E. Halfens RJ. Prevalence, risk factors and prevention of pressure ulcers in Dutch intensive care units. Results of a cross- sectional survey. 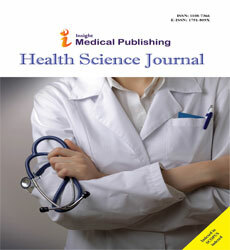 Journal of Intensive Care Med. 2001;27(10);1599-1605. Hunt J. Application of a pressure area risk calculator in an intensive care unit. Intensive and Critical Care Nursing 1993;9(4):226-231. Weststrate JT, Heule F. Prevalence of PU, Risk factors and use of pressure ulcer-relieving mattress in ICU patients. Connect the World of Critical Care Nursing 2001;1(3):77-82. Pender l, Frazier SK. The relationship between dermal pressure ulcers, oxygenation and perfusion in mechanically ventilated patients.. Intensive Crit Care Nurs 2005;21(1):29-38. Garber SL, Rintala DH. Pressure ulcers in veterans with spinal cord injury: a retrospective study. Journal of Rehabilitation research and Development 2003;40(5):433-442. Defloor T. The risk of pressure sores: a conceptual scheme. J ClinNur 1999;8 (2):206-216. Defloor T. The risk of pressure sores: a conceptual scheme. Journal of Clinical Nursing 1999;8(2):206-216. Clough NP. The cost of pressure area management in an intensive care unit. Journal of Wound Care1994;3:33-35. Lindgren M, Unosson M, Krantz AM. Pressure ulcer risk factors in patients undergoing surgery. Journal of Advanced Nursing 2005;50(6):605-612. Nijs N, Toppets A, Defloor T. Incidence and risk factors for pressure ulcers in the intensive care unit. J ClinNurs 2009;18 (9):1258-1266. Keller B, Wille J, Ramshorst V, der Werken C. pressure ulcers in intensive care patients :a review, of risk and prevention, Intensive Care Med 2002;28(10):1379-1388. Eachempati SR, Lynn JH, Barie PS. Factor influencing the development of decubitus ulcers in critically ill surgical patients. Crit Care Med 2001;29 (9):1678-1682. Frankel H, Sperry J, Kaplan L. Risk factors for pressure ulcer development in a best practice surgical intensive care unit. Am Surgical 2007;73 (12):1215-1217. De laat EH, Pickkers P, Schoonhoven L. Guideline implementation results in a decrease of pressure ulcer incidence in critically ill patients. Crit Care Med 2007;35(3):815-820. Defloor T, Grypdonck M. Pressure ulcer validation of two risk assessment scales. Journal of Clinical Nursing 2005;14 (3):373–382. Burdette-Taylor SR, Kass J. Heel ulcers in critical care unit: a major pressure problem. Critical Care Nursing 2002;25 (2):41–53. Health Council of the Netherlands: Pressure Ulcers. Publication No. 1999/23. ISBN: 90-5549-302-3. Lyder C. Pressure ulcer prevention and management. JAMA 2003;289 (2):223-226. Lyder C, Yu C, Stevenson D. Validating the Braden Scale for the prediction of pressure ulcer in blacks and Latino/Hispanic elders: a pilot study. Ostomy wound Manage 1998;44 (3Asuppl):42S-49S. Reddy M, Gill S, Rochon P. Preventing pressure ulcers: a systemic review JAMA 2006;296(8):974-984. Thomas DR, Goode PS, Tarquine PH, Allman RM. Hospital acquire pressure ulcers and risk of death. Journal of the American Geriatrics Society 1996;44(12):1435-1440. Pender LR, Frazier SK. The relationship between dermal pressure ulcers, oxygenation and perfusion in mechanically ventilated rs in ventilated intensive care patients.Health Science Journal.2014;8 (3) P a g e | 339 patients. Intensive Crit Care Nurs 2005;21(1):29-38. Manzano F, Navaro M, Roldan D, Moral M, Leyva I, Guerrero C. Pressure ulcer incidence and risk factors in ventilated intensive care patents. J Crit Care 2010;25(3):469-476. European Pressure Ulcer Advisory Panel (EPUAP). News from the Netherlands, evidence-based practice guidelines. EPUAP Review2003. Available at:http;//www.epuap.org/accessed 6June 2012. Defloor T, Grypdonck M. Validation of pressure ulcer risk assessment scales: a critique. Journal of Advanced Nursing 2004a;48(6):1-9. Baldelli B, Paciella M. Creation and implementation of a pressure ulcer prevention bundle improves patient outcomes. Am J Med Qual 2008;23 (2):135-142. Gray-Siracusa K, Scbrier L. Use of an intervention Bundle to eliminate pressure ulcers in critically care. J Nurs Care Qual 2011;26(3):216-225. Fernandes ML, Caliri MHL, Hass VJ. The effect of education intervention on pressure ulcer prevention knowledge of nursing professionals. Acta Paul Enferm 2008;21(2):305-11. Elliott R, Mckinley SH, Fox V. Quality improvement program to reduce the prevalence of pressure ulcers in an intensive care units. Am J Crit Care 2008;17(4):328-34.